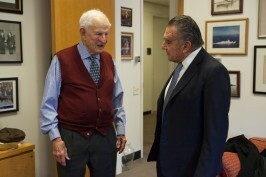 On 9 January 2014 the Chairman of the International Raoul Wallenberg’s Foundation, Eduardo Eurnekian, met Robert Morgenthau, District Attorney for New York County from 1975 to 2009 and next of kin to a family with a decisive political position during Franklin D. Roosevelt and Theodore Roosevelt administrations. 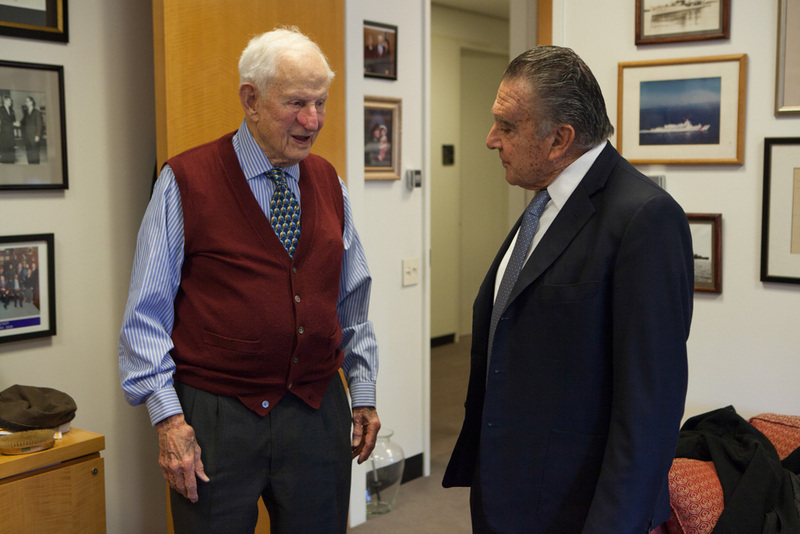 Eurnekian met Morgenthau in order to express the gratitude of the Wallenberg Foundation for the key humanitarian role played by his family on behalf of persecuted people, Armenians, Jewish and Gypsies among many other minorities, during WWI and WWII. Robert Morris Morgenthau is an American lawyer. 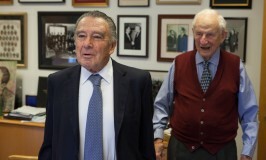 From 1975 until his retirement in 2009, he was the District Attorney for New York County, the borough of Manhattan. He is the second longest-serving district attorney in United States history. Robert Morris Morgenthau was born in 1919 in New York City into a prominent Jewish family that had emigrated from Baden in 1866. He is the son of Elinor Fatman and long-time Secretary of the Treasury Henry Morgenthau, Jr. His grandfather, Henry Morgenthau, Sr., was United States Ambassador to the Ottoman Empire during World War I. After graduating from the New Lincoln School, Deerfield Academy, and Amherst College, he enlisted in the United States Navy, serving for four and a half years, during World War II. He attained the final rank of Lieutenant Commander and served as the executive officer of both the USS Lansdale and the USS Harry F. Bauer. He saw action in both the Mediterranean and Pacific theaters, mostly aboard destroyers. Morgenthau graduated from Yale Law School in 1948. His father, Henry Morgenthau Jr. (1891-1967) was Secretary of the Treasure in the WWII years. On January 16, 1944, following Morgenthau’s advise, President Roosevelt agreed to create the War Refugee Board (WRB), the first major attempt of the United States to deal with the annihilation of European Jews. The Board sponsored the Raoul Wallenberg mission to Budapest and allowed an increasing number of Jews to enter the U.S. in 1944 and 1945. As many as 200,000 Jews were saved in this way. the Ottoman Empire during the First World War. As ambassador to the Ottoman Empire, Morgenthau has come to be identified as the most prominent American to speak out against the Armenian Genocide. Although the safety of American citizens, mostly Christian missionaries and Jews, was a major concern in the Ottoman Empire early in his ambassadorship, Morgenthau stated that the one issue he was most preoccupied was the Armenian Question. After the outbreak of war, the U.S. remained neutral so the American Embassy – and by extension Morgenthau – additionally represented many of the Allies’ interests in Constantinople, since they had withdrawn their diplomatic missions due to the hostilities. 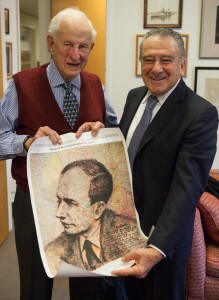 Robert Morgenthau and Eduardo Eurnekian with Peter Malkin’s portrait of Wallenberg. As Ottoman authorities began the extermination campaign of the Armenians in 1914-1915, Henry Morgenthau’s desk was flooded with reports nearly every hour by the American consuls residing in different parts of the Empire, documenting the massacres and deportation marches that were taking place. Faced with the accumulating evidence, he officially informed the U.S. government of the activities of the Ottoman government and asked for it to intervene. Henry Morgenthau is considered a hero in Armenia, where a tree in his honor stands on the Walk of Righteous Non-Armenians. Robert Morgenthau was a close friend of Peter Malkin (1927-2005), a former Israeli intelligence agent who in 1960 captured Adolf Eichmann in Argentina, and who afterward captured him again on paper, in his second career as a painter and writer. A Mossad agent for 27 years, Mr. Malkin was the author of a memoir, “Eichmann in My Hands” (Warner, 1990). Written with Harry Stein, it chronicles Mossad’s pursuit and capture of Eichmann, an architect of the Final Solution, the systematic Nazi program to exterminate Jews. The IRWF is an educational NGO created by Baruch Tenembaum, 2009 Nobel Peace Prize Nominee. Next article: Who left Raoul Wallenberg behind?